You are here: Home / Strainers / Gauge Taps: A great option for strainers today! Gauge taps on strainers have started to become a standard offering with some “pipeline strainer” manufacturers. 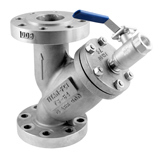 Strainers, with some end use customers, have been seen as optional in many applications. The reality is that using a strainer should be seen as a necessity, as well as a good “standard piping practice” in almost all piping systems. A strainer helps keep the flow media clean and can protect valuable equipment as well as other processes in a plant. 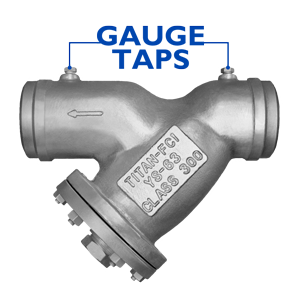 Blow-off valves can be installed on many pipeline strainers to facilitate in the cleaning of the screen or basket. One of the most common questions that comes up with a strainer is: “How does the end user know when they need to clean their strainer?” Many strainers provide a method to “blow down” the unit, which helps clean the strainer of debris in a quick and easy manner. But in many instances, the strainer needs to be fully inspected in order to keep the straining element clean, thus providing the most optimal flow and performance characteristics. Often the existing staining element can be cleaned and placed right back into service. There may be times, however, that a basket or screen may need to be replaced completely based on what was going through the unit, the degree of corrosion or physical damage that may have occurred, or for other reasons as determined by the end user. Severe damage can take place to a straining element if the strainer is not cleaned. As the unit gets clogged, the pressure inside of the strainer can increase and actually reach a point where the element is damaged or even crushed. This can become a serious situation in the strainer, for the piping system, and for the process. A common method to determine the need to clean the strainer is to monitor the flow going through the strainer. As the straining element becomes dirty (or clogged), less flow is allowed to go through the unit and the pressure drop will increase. 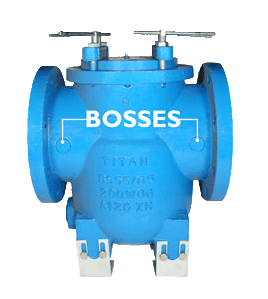 It has become common for some strainer manufacturers to include a boss (a raised or flattened area on a casting that could support a drilling and a tapping process). These are generally provided on the inlet and outlet portions of the bodies. These areas on the body are then more easily drilled and tapped. These drillings and taps would then allow the simple installation of pressure gauges that would then be used to monitor the pressures of the inlet and the outlet. Various tap methods are available. By observing the pressure drop when the unit is “clean” and by noting the pressure drop based on the calculations between the inlet gauge pressure and the outlet gauge pressure, one can determine a point at which the unit should be serviced. These calculations will take into account multiple inputs including pressure, media, application, etc. There are some strainer companies that have introduced strainers that are now provided (as standard) with fully drilled, tapped bodies. This makes it very easy for the end user to install gauges directly into the strainers, should they so desire. Purchasing a strainer with these drilled, tapped and plugged holes included is significantly less expensive than adding them in the field. The time, material and labor cost of drilling and tapping strainers in the field could, depending on the line size, end connection, and pressure class of the strainer, actually cost more than the actual strainer itself. This basket strainer shows an example of a strainer with bosses provided on the casting. They are not tapped for gauges yet. An example of a Y-Strainer with gauge taps. There are yet other options to help measure pressure drop in strainers. Rather than adding two individual gages for the inlet and outlet pressure comparison, one can purchase a differential pressure gauge. This is a gauge that will display the information from the inlet and outlet and show the actual differential pressure across the strainer. This is a simple, easy-to-read device that can show pressures drops, clean and dirty ranges, as well as caution areas. Many variables can be considered and monitored based on the customer’s specific application and needs.